Miranda's track record with men is horrible. Like most women in chick-lit books, Miranda has a horrible record with men. I mean she really has some bad luck. Never one to give up, she hopes to find Mr. Right. Clare finds out she is pregnant and her wonderful husband decides to leave her, citing the pregnancy as a deal breaker. Left alone, pregnant, working for a horrible boss, and without a home Clare is fairly discouraged about her future. Bev is the type of girl that every guy seems to avoid. She has dreams of a husband and kids and she wants them now. Unfortunately, everyone seems to sense this and run for the hills. Can these three women find love? Of course they can, this is chick-lit. It was cute and quirky but I did find myself laughing at the oddity of the plot and not just humorous situations that the characters found themselves in. Oooh I loved this one when I read it. It's funny I was just thinking, I'm in the mood for some chick-lit, I need to read one of those Jill Mansells I have on my Nook. I thought the humor in this one was great, btu I agree about developing relationships. I wanted more of her and the 'frien'. Their scenes together were always entertaining. Lol. I know. If the relationships would have been developed better it would have been perfect. Hi Alexis! Thanks for dropping by. I've not read any Chick lit for a loooong time. I'm looking for more humor and love in my books. ;) I'll look into this. Great review! I'm really in a "need for love" kind of mood as well. Maybe it is the weather. I've seen this book around and have wanted to read it for a while now. I think I will have to get it. Great review! Thanks! I saw it on my reader and it just jumped at me at that moment. i've never read anything by her, it does sound pretty cute! I've wanted to read Mansell's books but I always forget to look when I'm at the library! Will definitely check this one out, though! PS - I went through a chick lit phase back in January, so I know how you feel! Thanks! I was thinking people were going to think I was crazy. I'm glad you enjoyed this one Alexis. 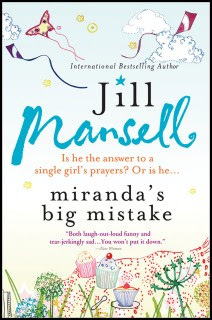 I'm a huge Jill Mansell fan. I just adore her books! I'll be reading her newest one soon and can't wait. This is my first. I enjoyed it. I'm sure I'll read more. It's cute, you might like her. Hi Alexis. I have had the urge lately to pick up a chic lit book. This sounds like something that I would like. I too go through stages of genre. Great review. Thanks! I know but Chick-Lit is an unusual stage for me because it is one of my least prefered genres. I blame it on Sophie Kinsella. Her books made me believe in the genre (as sappy as that sounds).